THE ORIGINAL KEEP A BREAST I LOVE BOOBIES! program has put the message of shame-free breast awareness in the global spotlight. Millions of young people are wearing the message on our signature i love boobies! 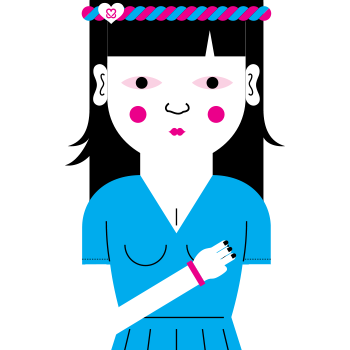 bracelets, and many of them are talking, blogging and writing about breast cancer awareness for the first time. We designed the program to spark a dialogue, and both the American Civil Liberties Union (ACLU) and a U.S. District Court have joined in to voice their support of i love boobies! Imitation may be the sincerest form of flattery, but don’t be fooled by knock-off merchandise! We’ve located manufacturers from China to San Francisco who are producing fake i love boobies! gear. But only the proceeds from our i love boobies! merchandise is directed back to breast cancer education and awareness programs. 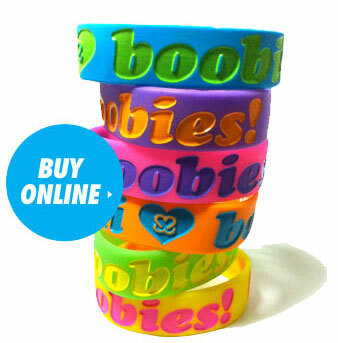 Purchase our original i love boobies! bracelets, T-shirts, hats and other items either online from our online shop here, from partner retailers such as Tilly’s and Zumiez, or directly from our Traveling Education Booth, located at official KAB events or festivals like the Vans Warped Tour. i love boobies! is KAB’s signature breast cancer outreach and awareness program. We want to remove the shame associated with breasts and breast health, and this message represents our positive approach to breast cancer dialogue. The program resonates with young people, and encourages them to be open and active about breast cancer prevention. The program gives young people impacted by breast cancer the chance to express and connect with others. Wearing an i love boobies! bracelet or shirt proclaims, “I love my boobies, and I choose to take care of them!” It is a message about how important it is to appreciate, respect and love your breasts and yourself. Knowing you body and your breasts is the first step to prevention. HOW DOES IT SUPPORT THE KAB MISSION? i love boobies! has successfully initiated a dialogue among young people about breast cancer. Is has proven to be a doorway to involvement in KAB’s other programs, and has brought the subject of early onset breast cancer to the national media. Revenues from i love boobies! cause merchandise has allowed KAB to broaden its reach and provide grant money supporting important studies. CAN I PARTICIPATE? Anyone—female or male of any age—can use the i love boobies! message and spark up a conversation We are constantly developing new ways to spread the message among all types of people. Our iconic bracelets are only the beginning. WHERE DO I START? All of our i love boobies! cause merchandise is available online. Please visit our shop here to browse what is currently available. Always wear the slogan with an open mind: Use it to start discussions, learn from others, and share ideas. FEDERAL COURT RULES IN FAVOR OF STUDENTS IN I LOVE BOOBIES! BRACELET SCHOOL BAN When Keep A Breast first created the “i love boobies!” bracelet we had no idea the controversy that it would stir up. When the first banning happened in schools we were left wondering: Why were many not focused on the fact that young people were finally talking about breast cancer and breast health? Many of you stood up and became outspoken advocates for our cause. We applauded as you held school events to raise awareness and funds for KAB, and retweeted photos of loved ones battling breast cancer, our bracelets visible. Your emails and social media posts about why you wore your bracelets made us cry many times. You believed in us – and our messaging - and we can’t begin to express our appreciation.